Syn. 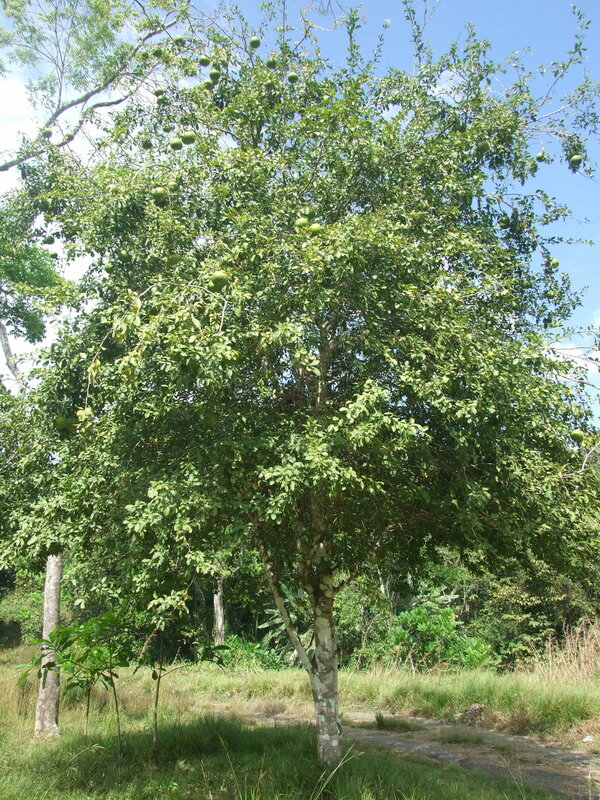 Feronia pellucida, Crataeva marmelos) Bael fruit is a citrus relative. One can see the similarity in the leaves and growth habit of the tree. Bael fruit is native to the dry forests, in the hills and plains of Burma, Pakistan and Bangladesh. The species can be found cultivated throughout India, where, due to its status as a sacred tree is grown in Buddhist temples where monks slice and dry fruit, then heat it in water to make a popular hot drink. The tree can be found cultivated in Southeast Asia, Indo-China, Thailand and N. Malaysia. Bael grows up to 15 m in height. The bark is smooth and light gray in color, leaves are relatively small, deciduous, alternate, ovate - lanceolate, trifoliate. Branches are spiny. Like many of the Rutaceae family, Bael has fragrant flowers. The fruit matures at between five and twenty centimeters. The ones I've seen are typically the size of a softball and has hard brittle shell, not dissimilar to that of the calabash tree. The inside is full of a very sticky, fibrous pulp around many seeds, which look like large grapefruit seeds. The outside is a hard, brittle shell, slightly thicker then that of the calabash tree. When ripe, the fruit emits an extremely pleasant aroma and can sit around for weeks doing so. Superior cultivars can yield over 400 fruit a year. Better varieties tend to have thinner rinds. The tree I have collected seed from seems to produce a lot, but the rinds are fairly thick, the fruit basically has to be stomped on, thrown onto a hard surface, or hit with a hammer to be broken open. The leaves of Bael fruit are considered sacred in the Hindu culture, offered as sacrament to Lord Shiva, thus it is highly prohibited to uproot the trees. Shiva is believed to live underneath the tree. The fruit is also made into jams and preserves. Young leaves and shoots are used to season food in Indonesia and eaten as a vegetable in Thailand. Above all else Bael fruit seems to have potential for its medicinal benefits. In Asia it is widely used for such purposes. The fruit, roots and leaves all have antibiotic qualities. Unripe fruit are eaten by those recovering from dysentery. In India it is a highly revered as an aphrodisiac. Large quantities of the fruit are considered to act as a depressant, slowing the heart rate and inducing sleepiness. Juice extracted from the leaves is given to relieve the symptoms of asthma and fever. Tea made from the flowers is used to cleanse eye infections. Tea made from the root are used to relieve heart palpitations, indigestion, bowel inflammations and to stop vomiting and relieve nausea. Interestingly, the fruit pulp, in addition to its edible and medicinal properties, is also used as glue; mixed with lime and plaster and employed as a sealant; mixed with cement and used when building walls; and added to watercolor paints. In the cosmetic industry the limonene-rich oil is used to scent hair products. The rind yields a yellow dye. Trees can grow in a wide variety of soils in full sun or partial shade. It is considered sub-trpopical but I grow it in Panama, the full=on tropics. Again, I am not familiar with a wide range of varieties, the one I have eaten has many seeds surrounded by a thick, stick pulp. The pulp is somewhat similar in consistency to other citrus, and is divided into sections. The pulp is very aromatic. As is done traditionally in Asia, I have consumed it in a drink, basically made a tea out of the pulp.